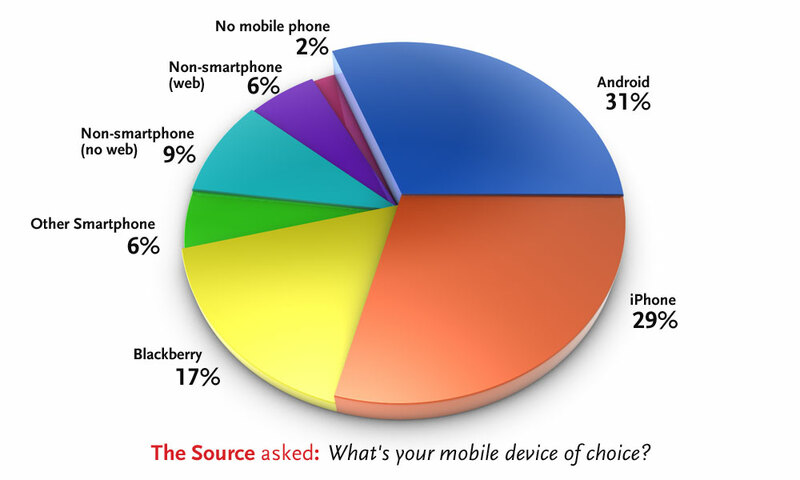 In our recent (unscientific) poll of Source readers, 83% report having some sort of smartphone. Android devices are the most popular, just beating out the iPhone. At the same time, over 10% of readers report having no mobile web access at all. Of course, this poll only represents the Source readership, who are likely some of the more tech savvy of Metro customers. Still, it implies that smartphone apps are probably worth investing in and that Metro would be smart to study cross platform apps. After the jump, comments from readers. I’m a Palm Pre user myself (for the moment), but frankly the best thing Metro could do would be to politely lean on other municipal operators (SM Big Blue Bus, Culver City Bus, etc.) to cooperate with Google Transit. Besides being useful on Google Maps’ website, they make EXCELLENT apps already (including for the Palm Pre). Google Maps already had excellent integration with Metro (a big thank you!) — and that move was the single best thing to make Metro service easier to use. But since other municipal operators haven’t yet gotten on board (inexcusable, if you ask me, even if they have been “planning” to cooperate for…years) they might as well not exist for those planning trips using Google Maps/Google Maps app. Joel Espinoza likes the current iPhone app but wishes subway tunnels had wi-fi. This is something Metro is currently studying. The new Iphone app is fantastic! I have been using it often to see how accurate and honest the app can be. While ATT service is bad, the app seems to work fine, except underground. I am unsure if WIFI would really boost usage, however it might convince more people to explore the app while riding. Android will probably overtake the iphone in a couple years for various reasons. It’s kind of silly, and short sighted, to only make an app for the iPhone. Please start working on a Flash/Flex based Metro Mobile Web App that integrates with Google Maps/Transit. Sooner or later all smart phones will have the capability to view Flash files, and once that happens, you’ll have the ability to create a single web application that can work across all mobile OS builds. Think about the future Metro, and get working on a Flash application please! How about WiFi on the subway? They have it in San Francisco. Metro staff has been looking into it. Nothing has been decided yet, but the agency is getting more information from cell phone service providers. I would argue against Flash/flex for the web app. It’s actually unlikely that every smart phone will have the ability to view flash files. In the mean while, HTML5 is supported now and will do everything that is necessary for a Metro Mobile web app. And the Android army marches on. Yes, please bring wifi to the tunnels ASAP. Thank you. This unscientific poll based on souce readership.